An ideal wedding venue, canoe hire/cafe, art/photographer studio, rental, glamping, boat storage or creative space. 5 minutes to the surf beach! 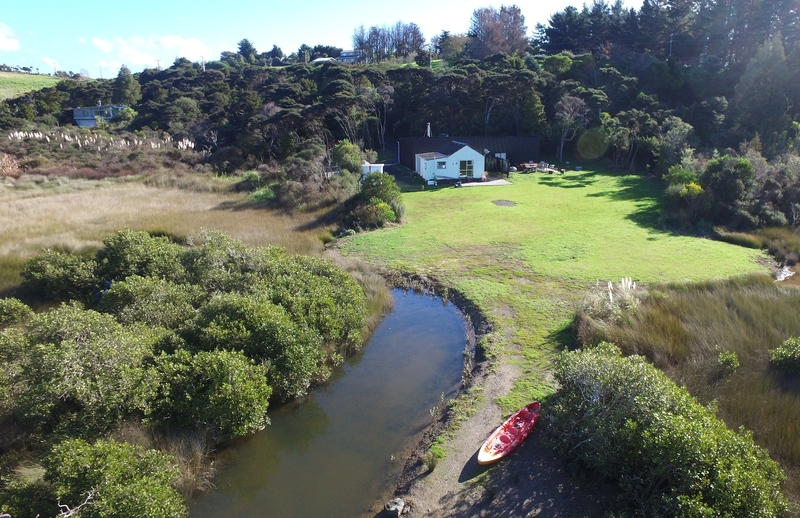 This hidden slice of paradise for boating, fishing, glorious sunrises and sunsets, jet skiing from your front door on the estuary to the tavern and hours on the lawn simply enjoying this magical location could all be yours. Writers, artists, mechanics or anyone with creativity will love this property. An easy-care retreat on the water. Our owner has loved living here and we feel quite sure you will love it too. Rare private - waterfront prime coastal location. A garden path to a secret hideaway - could be perfect for future visitor Chalets or Glamping! Kauri lined original schoolhouse 39sqm's with 1 Bedroom, 1 Bathroom, open plan dining/lounge area, plus a large new 162sqm 4.2 metre high stud enclosed shed with fireplace, fully insulated and lined with an extra-large remotecontrolled garage door. 3 Offices or Storage areas, Bathrooms, Lunchroom/Conference room plus Work area/Studio or whatever you dream of this can be configured to!